Are you a house stalker (like me)? Do you casually peruse the real estate section for fun? Do you daydream about living in different types of homes? If so, I have a blog for you. 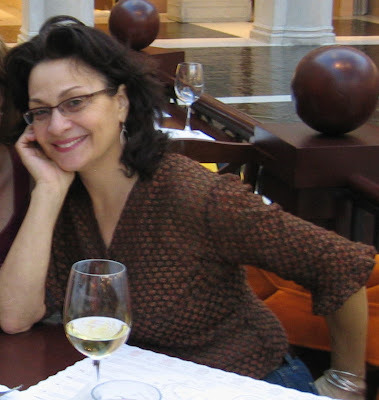 Meet Cara of casaCARA who, aside from being a successful writer, just so happens to "collect" old houses. She owns an 1830s brick row house and a 1850s mews house in Brooklyn, several Philadelphia properties including a 1810 former parsonage and an 1840s double trinity, a 1930s cottage on 20 acres in northern Dutchess County and a cottage in Springs, Long Island. Wow! As someone who gets quite excited when I met someone who owns just one old home, you can imagine how inspired I am by her collection. I think its safe to say she is an authority on all things related to old homes. WHAT'S THE BIGGEST COLOR CLICHE IN THE BEACH COTTAGE BOOK? That's right: blue and white. Sorry, but that's what I wanted for my first house at the beach, a fixer-upper in Springs, N.Y. (a hamlet five miles north of East Hampton waaaaaay out at the end of Long Island) that I bought in May 2009. As a longtime city person and Brooklyn resident, I'd never done the beachy blue-and-white thing. It's not as easy as it seems when you're an inveterate yard-sale shopper like myself. I keep bringing in things in red, orange, green, and every color of the rainbow. But with a can of Benjamin Moore's Sailor Sea Blue and a bit of ruthless editing, I've managed to give my kitchen a healthy dose of the color, with more to come. 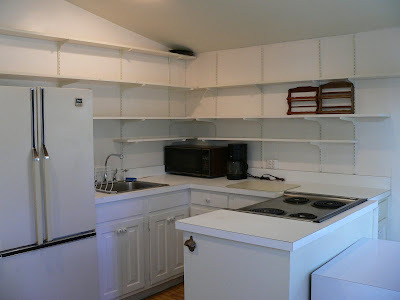 I'm planning to paint the rest of the under-cabinets blue and the floor white. 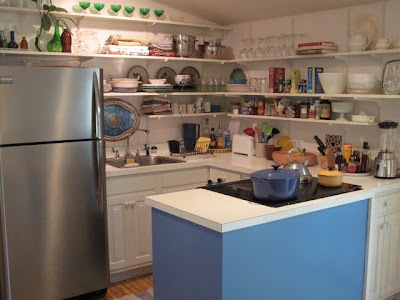 As you can see from the 'before' picture, I didn't need to do anything major in the kitchen besides replace the grotty old refrigerator with a stainless steel Frigidaire that I love for its smooth lines and utter lack of detail, and the nasty existing electric stove with a sleek glass cooktop. 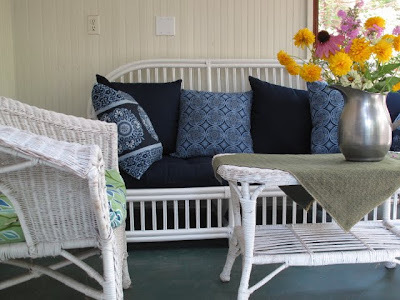 For the screened porch, I spent three days hand-painting a 1930s stick rattan sofa left by the previous owners white (I'm not a fan of aerosol sprays). Then, from the Restoration Hardware catalogue, I ordered a set of navy and cornflower blue sofa cushions that happen to fit perfectly. Voila! I am on my way to the blue and white beach house of my dreams! Thank you so much Cara! 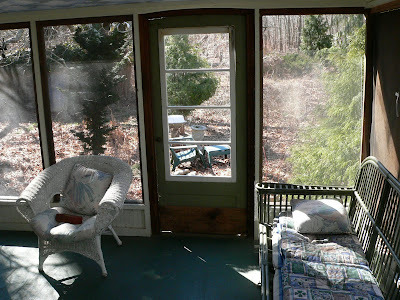 To read more about Casacara's city slicker's adventures in cottage living, go pay her a visit. If you are enjoying these guest bloggers, please stick around as there are more goodies to come. Wow! Now THAT'S a collection! I can't wait to read her blog! Okay, I'm enjoying all these guest bloggers, but the situation really begs the question...WHERE IN THIS FABULOUS WORLD ARE YOU THIS TIME?! I too love all these guests, you are a fabulous host, hope you are having fun.